Steve Potter, son of Ted Potter, who was drummer for a while in Lennie's quartet in the 1960s grew up with Lennie's family and via family members adds a bit of background. "My mother recalled that Lennie turned down an opportunity for the quartet to become fully profesional with a residency somewhere, as he wanted to stay true to the type of jazz he wanted to play. Apparently my dad was not too pleased at the missed opportunity to make some better money! She also is pretty sure that Lennie's day time job was working for a newspaper.London Evening News or Evening Standard she thinks. He was the manager of Potter's Music Shop in Kingston. My parents had three shops. The main one was in Croydon which they ran, my uncle ran the one in Richmond and Lennie ran the Kingston one for a while. That would have been in the early sixties." Double bass player Spike Heatley adds "I certainly remember Lennie and worked with him often at the Bulls Head. He was indeed a fine player but can`t agree that he was the best of the British players as he was around at the same time as Bill LeSage who actually was phenomenal although perhaps his best playing was not recorded. On concerts however, he excelled, full of ideas and a technique most vibists could only dream of! Lennie played a totally different way, rather simpler but just as effective in his own way, on top of that, he was a real nice guy, modest and charming." Ah Lennie! I used to co-run the Highgate Jazz Club at The Gatehouse, at the top of Highgate West Hill in the 1960s as bass player with the Colin Peters Quintet. 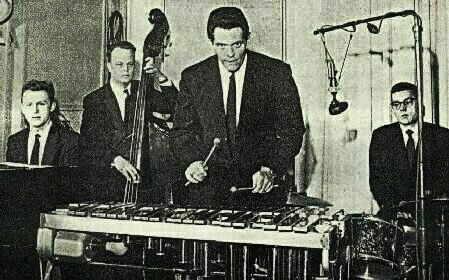 We had a guest artist every Friday, John Dankworth, Ronnie Ross, Jimmy Skidmore, Joe Harriott, Bert Courtley, Ian Carr, Kathy Stobart, Tubby Hayes, Pete King ...... the list seems endless. Even Jimmy Witherspoon on one occasion but that's another story. Lennie frequently guested with us and he was always a delight, both in his excellent musicianship and expansive personality. I can still see him In my mind's eye, clanking all the notes together at the end of the evening, before wrapping them in an old grey blanket, to the inevitable cry, "that's the best they've sounded all night, Lennie". He was hugely popular and quite rightly so. Although Lennie Best never made a commercial recording in the last few years a number of recordings have come to light. Stuart Little rescued a performance from a BBC programme broadcast in 1962. The tape, found by his brother Bob, was in very poor condition and was converted to an audio CD by Stuart's KLA Film and Video Communications in 2011. The CD consists of just four minutes of music. The title is "The St Vitus Dance" and it by the Lennie Best Quartet comprising Lennie (vibes), Stan Jones (piano), Ted Potter (drums), and an unknown bass player. 1962 The "The St Vitus Dance" by the Lennie Best Quartet comprising Lennie (vibes), Stan Jones (piano), Ted Potter (drums), and an unknown bass player. 1961/7 Seven tracks by the legendary vibes player who was never recorded commercially. One track is from a 1961 BBC recording and the other six come from a BBC Jazz Club of December 27th, 1967. Three titles from this latter date have a vocal from Norma Winstone.